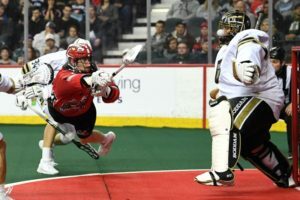 On Saturday February 2, the Calgary Roughnecks (4-4) broke their downward spiral defeating the Vancouver Warriors (2-6) by the score of 8-5 in the final meeting of the two teams in the 2019 season. Vancouver would jump to an early lead scoring three goals in four shots, stunning the home team. The Roughnecks continued to struggle on offense missing the easy pass and miscommunications. There was a lot of physical play on and off ball during the first quarter and Calgary with a three goal deficit heading into the first quarter break. Scoring for the Warriors would come from Logan Schuss with two (2G, 1A); James Rahe (1G); and Jordan McBride (1G, 1). Calgary would put two up, coming from Rhys Duch (2G, 2A); and Curtis Dickson (3G). Score at the end of one: Vancouver 5—Calgary 2. A solid defensive performance by Calgary would hold the Warriors scoreless in the second quarter. The only goal registered in the frame by Calgary would come from Dane Dobbie (1G, 4A) 58 seconds in cutting the Vancouver lead to one (4-3) leaving the fans to watch 14 minutes of unending defense and very little offense as both teams continued to have issues not spreading the ball around. At the end of the first half Calgary would lead in shots on goal 26-20 over Vancouver. Score at the end of two: Warriors 4—Roughnecks 3. Calgary would control not only the third, but the remainder of the game as they would hold the Warriors to one goal. Dan Taylor (1G, 1A) would sneak the behind the back shot over the shoulder of Warriors net minder Eric Penny at 3:05 tying the game at four. Dickson would score at 7:08 as the fans continued to see great defense and virtually no offense. The physicality continued between these rival teams, while Vancouver experienced a goal drought at the hands of Christian Del Bianco. Score at the end of three: Roughnecks 5—Warriors 4. Entering the final fifteen, Calgary would hold a one goal lead for the first time in the contest and began to look more cohesive as a unit. At 3:18, Vancouver’s Mitch Jones (1G, 4A) would dive through the crease tying the game at five apiece and ending their scoring drought. But it would be the Roughnecks who would dominate the remaining nine as Mitch Wilde (1G) wired the go ahead goal from the point using the defender to screen Penny. Following Dickson’s hat trick goal celebration, a scrum developed. After the smoke cleared Calgary found themselves in a power play situation as the Warriors would have three head to the box for roughing majors, Matt Beers; Zack Porter; and Tyler Codron at the 12:45 mark. 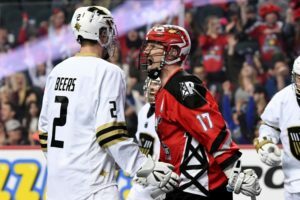 Ranked eighth in the NLL Calgary’s victory was sealed with their first man up goal from the point by none other than Duch. Shots on goal as the buzzer sounded—Calgary 5o, Vancouver 40. Final Score: Roughnecks 8—Vancouver 5. The Roughnecks would finish one for three on the power play, and successfully shut down Vancouver’s power play zero for three. On Friday February 8, Vancouver (2-6) heads down to San Diego to face their Western Division Rivals the First Place Seals (4-2), game time 10:00 p.m. EST. Calgary (4-4) will make the trip to Saskatchewan on Saturday February 9 to face the Rush (3-3), game time 8:30 p.m. EST.